Your dog depends on your help to overcome fear! The psychological stress of continued fear can harm the organic health of your dog. 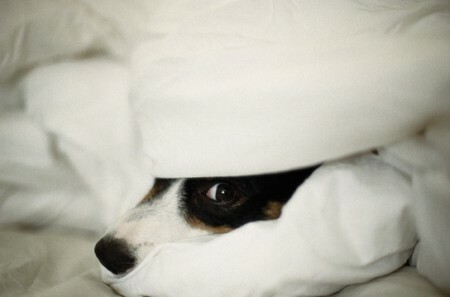 (A) Your dog hides, trembling, maybe whimpering in a corner, each time there is a strange or loud noise. It is difficult to convince the animal to come out of hiding. 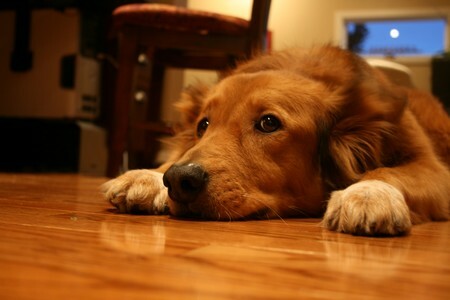 (B) Whether they are people or other dogs, your pet is frightened by them each time. Your dog reacts with fearful demeanor every time it is taken to an unfamiliar environment. (C) The dog barks threateningly at every other dog “Don’t get any closer to me!” Even very small dogs bark like this at large stranger. (D) When you walk your dog it is likely to be aggressive toward humans and animals alike. (A) Some dogs are born fearful. (B) The dog was exposed to a psychological trauma or to a frightening experience at an earlier age in its life. Such trauma can block normal behavior. Any new environment scares the animal. (C) “Fear biting” is an aggressive expression of fear. The normal expression would be flight. (D) The dog’s protective behavior on your behalf is strongly expressed toward others. Important: Never chide a fearful animal! No matter how minor the incident might seem to you, the animal would lose its trust in you. If your dog is nervous and fearful-hyperactive, try a treatment with Nervoheel tablets. This will gently calm the internal unrest. Rescue drops are indicated only in cases of emergency. They should be stopped as soon as the behavior has normalized. Prepare for an office call if your dog has not shown any improvement within four weeks of home treatment. High-potentates homeopathic medications are indicated to regulate psychological imbalances. You may be asked to aid the treatments by using color therapy at home. The veterinarian trained in holistic techniques will help you in the selection of Bach Rowers for your dog’s specific needs. Above all, you need to inspire trust between yourself and your four-legged friend. If you are not quite sure what exactly will be in the best interest of your dog, you might consider attending a dog training course. Miniature breeds show a relatively high incident of congenital fearful behaviors. Pet owners have to pay close attention to their interactions with their dogs. Mistakes could harm the psychological well-being of a sensitive animal.